From Highland Park to Brookline, North Side to Shady Side, Fairywood to Squirrel Hill, Access Elevator provides customized stair lift installations for customers all over Pittsburgh. Access Elevator will perform a stair lift installation with minimal disruption to your Pittsburgh home. 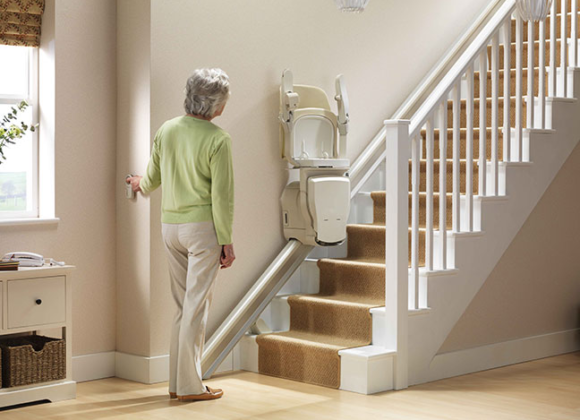 We install a line of stair lifts from Stannah, a leading, well-established manufacturer. Choose from the streamlined Stannah Siena with washable vinyl upholstery and accommodations for narrow stairs; the completely customizable Stannah Starla with numerous options for upholstery fabric, colors, trim materials, and seat width; the outstanding Stannah Sadler that keeps you in near-standing position to minimize strain on your back, hips, and knees; the economical Stannah Scout, which incorporates safety features like battery backup and obstruction sensors; or the rugged Stannah Outdoor, with weather-resistant construction and a protective cover. Our stair lift installation will not require the use of any screws, nails, or other hardware in the walls of your Pittsburgh abode. Access Elevator will install your stair lift hardware directly on your stairs, making the stair lift installation more stable and minimizing the impact on the look of your home. And, since the rails needed for your stair lift installation aren’t bulky, they won’t crowd out the walkable area of your staircase. Family members and visitors to your Pittsburgh home won’t have to climb over or skirt around the stair lift, since the narrow rails stay out of their way—and the stair lift’s chair, armrests, and footrest fold away easily and compactly. You may be concerned that your stair lift installation, while convenient and practical, will radically alter the look of your Pittsburgh home. Access Elevator makes sure that our stair lift installation process not only leaves you with a safe, functional stair lift. It also blends in seamlessly with the feel and décor of your home. A stair lift installation by Access Elevator includes many customizable features for our Pittsburgh area customers. Before Access Elevator begins any stair lift installation, we will explain all of the possible stair lift customizations. Once you’ve determined the look of your stair lift—including the chair’s color, upholstery, and trim—our experienced staff will bring your vision to life in your Pittsburgh home. Because a stair lift installation doesn’t require any remodeling of your walls, Access Elevator can usually complete your stair lift installation in less than a day. That means our Pittsburgh customers can enjoy all the benefits of their new stair lifts shortly after delivery, with little interruption of their household routines. To get started with a stair lift installation that will transform your life, but not the look of your Pittsburgh home, call Access Elevator today at (412) 781-9111 to arrange a free, in-home consultation.